revealing the conifer covered shoreline and small rocky islands rising above the crystal water of the bay, it never did. Our one hour crossing was a soft focus blur, interrupted by moments of hopeful clarity, only to be obscured once again. So, we arrived on the island missing a sense of context. Then we continued to stumble into patches of fog shrouding land and sea during the rest of the day, as we began exploring San Juan. The island has a Spanish name, because Spain explored, charted and named it in the 1790s. It is a tiny island, just 16 miles long and about six or seven miles wide at its widest point, but it lies in the middle of straits dividing Canada and the United States. Spain bowed out of the region, but Britain and the United States both staked their claim to the Island in the 1800s. This year the Park is celebrating the Sesquicentennial of the Pig War Crisis of 1859, or what I like to think of as Bay of Pigs I. The crisis was precipitated when a British pig escaped from the Hudson Bay Company compound and started rooting around in an American citizen's garden. The American shot the pig, and British authorities retaliated by threatening to arrest him and evict the other Americans from the island. The Americans sought protection from the U.S. Army, which sent a 64 man unit of reinforcements to the island, which led the British Navy to respond with three warships and 400 Royal Marines. The Army sent more reinforcements. Fortunately, word of this overblown response to a dead pig finally reached Washington, cooler heads prevailed, and the two sides agreed to a peaceful joint military occupation of the island, with an English Camp at the north end, and American Camp 13 miles away at the south end. In 1872, the two sides called upon Kaiser Wilhelm of Germany to arbitrate the question of who should own the island. He decided the Americans had the more legitimate claim to it, and the British troops left immediately. The two camps, or what remains of them, are now a National Park. On Friday, reenacters were setting up their tents in the British Camp, preparing for a Sesquicentennial weekend celebration. Although we missed the big event, because we left on Saturday, we enjoyed watching them pitch camp. I talked with a Park Ranger who is an avid reenacter, and has been playing the roles of soldiers from many sides in many wars all across the country for the past 35 years. He was retiring from his Ranger job on Sunday, but planned to continue as a volunteer until the day he died. On the opposite end of the reenactor spectrum, at our B&B, we chatted over breakfast with a couple whose 14-year-old son was staying at the encampment, playing the role of a young British soldier. He is more excited about drills, muskets, and shooting black powder loaded guns than he is about history right now, but his parents hope that eventually some of the historical aspects of this hobby might capture his imagination, as well. Speaking of our B&B--Inn to the Woods--it is hands down our finest accommodation of this trip. It stands high on a conifer covered hill. Our spacious room has a large window and glass door out to a private balcony with a hot tub and a view through the evergreens of a pretty little lake. It would be a relaxing place to just sit and read or snooze away an afternoon, but, of course, we don't do that. We get out early and arrive back late. as it turns out. 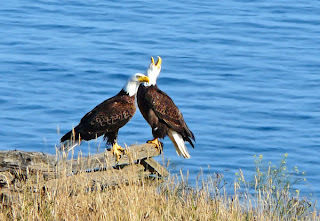 He tells us that when he was looking at real estate on the island years ago, he noticed that this spot was "exceptionally birdy." Since then, he has strategically placed feeders, water, and plantings to attract even more birds. We watch the action around his porch and property for a couple hours before we move on to other habitats. He has one of the original Hudson Bay Company log cabins on his land, and the outhouse he invites us to use looks as though it is Hudson Bay vintage, as well. The unusual lean-to design does not include a door, but merely points in the direction of thick woods, where you have to hope no one is blazing a new trail while the outhouse is in use. By the time our guided day ends at 6 p.m., we have birded in woods and valleys, across grassy fields, by a fresh water lake and marsh, and along the rocky shore. We have added 13 new birds to our life list, and learned far more than we will ever be able to remember about the plants, animals, birds, native people and history of this island. We have had a wonderful day. On Friday, we explore the island on our own. We take a self-guided walking tour around English Camp and hike a few scenic trails through the woods in the morning. 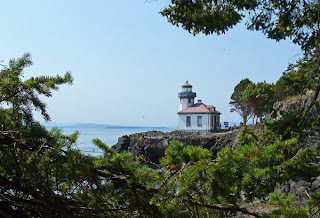 Then we take our lunch to Lime Kiln State Park, the country's first state park dedicated to whale watching. There are three resident pods of orca whales that hang far out in the waters offshore from the park, and many people come here in hopes of seeing them pass by close to shore. We do not see a whale during lunch today. After lunch, we hike to a lighthouse on a point near these whale watching waters. There are lots of interpretive signs by the lighthouse that make it clear that the chances of seeing a whale here are probably better than the chances of winning the lottery, but not a lot better. The last whale sighting was at 11 p.m. last night, we read on a blackboard. Then we look at a chart. Last year, orcas were only sighted here 150 times. We don't feel so bad about not seeing a whale after all. The odds were against it. But, it was a lovely place to picnic, nonetheless. The park also features, as its name implies, the ruins of lime kilns used from the late 1800s well into the 1900s. Limestone was quarried on the island, broken into six inch diameter chunks, fed into the 1,000 degree kilns, and shoveled out the bottom as lime. To keep the fires burning took prodigious quantities of wood, and they practically denuded the whole island of trees before lime production ceased. There is little old growth forest here, but the island has recovered well. Where conifers have not reclaimed the land, there are orchards and farms. We tasted wine at an island vineyard and winery, and stopped to admire fields in purple bloom at a lavender farm. There are fields of grazing sheep and goats, lots of horses, and even an alpaca farm (with a lone camel who probably wonders how he got here among the alpacas). Friday Harbor, where the ferry docks, is the main town on the island, with many coffee shops and restaurants, and other lures to tourists. The bakery/espresso shop here opens at 4 a.m. to serve the early ferry, and stays open until the last ferry of the evening. We love this shop—it's where we got our coffee and pastries at 6:30 a.m. before bird watching, and where we went at night when we craved a sweet end to our day. After enjoying a pizza and a great local blues band at an Italian restaurant in town, we stopped in at the bakery for a late night fresh strawberry rhubarb cobbler. you can just leave it there, and stroll about town until boarding time. 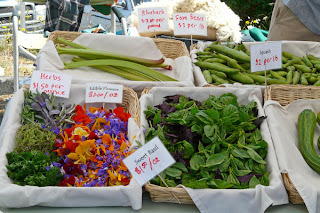 While our car sat in the ferry queue, we enjoyed the Friday Harbor Farmer's Market that happens every Saturday. It was a wonderful opportunity to see all the products that come from the farms we passed as we drove around the island. There were fresh cut flowers, goat cheese, organic eggs, berries, herbs, honey, bread, meat and fish vendors, and baked goods, all sold on a bluff overlooking the bay and marina below. 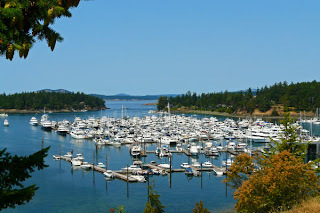 We took a stroll around the Friday Harbor Marina before heading back to our car. We think the San Juan Islands would be a tremendous cruising ground—scenic, with many fun ports of call--akin to the Chesapeake Bay, but not as hot in the summer. Based on the huge number of beautiful boats here and at the Roche Harbor Marina on the other end of the island, there are many boaters here who would agree. Our ferry ride back to the mainland was fog-free. We ate our lunch at a table next to a window, watching the scenery go by. There were lots of Saturday sailors, trawlers and fast boaters all around, and even a ski plane or two threading through the traffic to find a straight line for take-off. 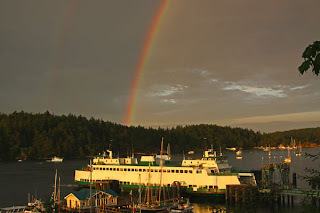 San Juan Island has been a highlight of our journey, and we can imagine spending much longer in this area exploring the other islands in the San Juans, but we are both ready to head home now.